On this, the 283rd and 205th commemoration of your births, I feel it incumbent upon me to write this letter. We have strayed far from the legacy which you bestowed upon this great nation. The horizon is very dark indeed. I admit this with shame, not due to any degradation of America on my part, but because she was degraded on my watch. I seek whole-heartedly a return to the robust tradition of Republicanism and Liberty which was your gift to the world, yet cannot help but acknowledge the guilt I bear for failing to halt the encroachment of tyranny in this land. Instead of unfurling the powerful wings of Liberty, which can lift all men alike from the darkness of indentured poverty, we became afraid. Frightened by the specter of failure, we began to shrink from the dangerous blessing of liberty; finding the comforting servitude of safety more appealing than the bracing uncertainty of freedom. We have never known deprivation as past generations of Americans endured and too many were ensorcelled by the siren song of strength. The flow of power was reversed. No longer was government tolerated as a necessary evil which secured the rights of a nation of individuals. Instead, government became the granter, and revoker, of the inalienable rights given to every man, woman, and child by their Creator. Because fallen Man incessantly craves power over his neighbor, over time the government has been shaped into a tool which serves to augment or to deprive the citizen of his rights, depending on the jealous pleasure of the hand wielding the tool. We are not ruled by King George as President Washington once was, yet our tyrant is more onerous still. Instead of a monarch, sitting on a throne across the globe, we find ourselves ruled by a faceless, endless bureaucracy which replicates itself, sinking its tendrils ever deeper into the American soul. We have no figure-head to rebuke by stinging declaration, but are repressed by nameless accountants and voracious barristers. There are no tax collectors, ripe for our tar and feathering; instead we deal with form letters, intolerable phone queues, wage garnishment, and legislation by fiat without recourse or appeal. This nation has defied the natural balance of Federalism and shredded the benefits of a Republic. We no longer possess the balance which comes from a collection of strong states, contributing to a national dialogue. The strength of a federalist system comes from the diversity of voices, each secure in its sovereignty, which find consensus and respect divergence. We have allowed the head to reign while the body parts atrophy, and as a result our descent into tyranny is proceeding at a rapid clip. We have stood idly by, as diabolical Progressive policies have thrust our black brothers and sisters into a spiral of dependence and poverty. Too often we have been cowed by pencil-necked professors and porcine agitators who deal in racism as other men deal in manure, shoveling it thickly for anyone willing to spare a dime. Astonishingly, the health of the black family is worse than it was under the lash of slavery. How tragic it is to comprehend that Progressive political policies could dissolve black families more thoroughly than the whips and chains of forced servitude ever did. Even more tragic is to learn that the black community continues to support these policies by an overwhelming majority. Thankfully, some of the most articulate and ferocious voices speaking up to defend this Republic today are from the black community itself; just as proud patriots like Crispus Attucks, Benjamin Lattimore, and Frederick Douglass were found on the front lines in their day. I pray that following the elections of this November we might begin to return to the principles on which you gentlemen established and protected this great nation. It will take men and women of indomitable moral strength and iron will and we would all do well to take time this year to study the lives and characters of the men and women who labored for our freedom. 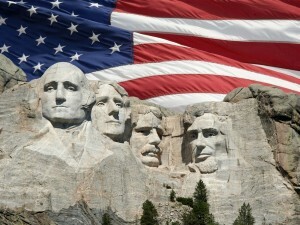 On this Presidents Day, we honor the men you were and country you gave your lives to serve. The diabolical democrats and the rubber stamp republicans are thrusting all of us into poverty. Their lust for power and craving to be needed is exceeded only by their narcissistic drive to be worshiped. It’s a mental disorder and a spiritual deficiency. They must be removed from political power, that’s all. The onset of cancer takes care of the rest.